I’ve had embroidery on the brain for a while now. I’ve been doing more thinking than stitching up to this point, and I’ve finally made some silk I’m happy with so I’ve started work on a project. This is a sample for me to get my hand around working with the silk; by about the third petal, the silk was finally starting to talk to me and tell me how to work with it. I’ve looked at videos, read books – but I find with any tactile technique, having the actual stuff in my hands is the best teacher. This is about half the weight of the embroidery silk I had made previously; it’s four (instead of 8) of my forty-denier (or so) filaments, with a light twist that I can then work back out during the stitching. Dyes are Jacquard acids. The peony underway. 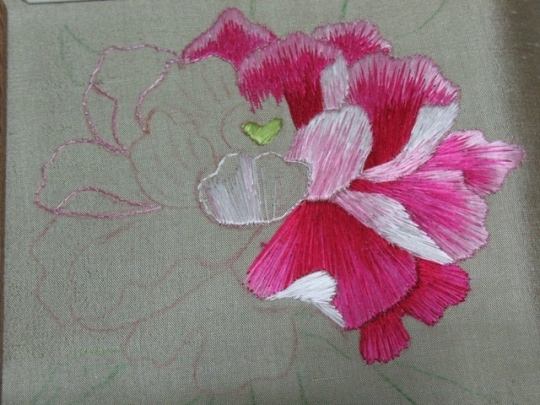 I started by drawing the peony freehand onto the silk, based on a piece embroidered by Young Yang Chung (photo taken from her book, below) and then stitching the outlines and starting to fill with long and short stitch. The main thing that took me a while, was figuring out that I could make LONG stitches… some of them an inch or more – to get the look I want. I’ve been looking at photos and actual pieces of Chinese and Korean embroidery, which is the look I’m after; they take some surprisingly long stitches, which brings a lot of sheen to the surface as the light reflects off the long silk. I’m going to Kid & Ewe & Lamas Too this weekend. I’m guessing that it’s “Lamas” meaning “Members of Genus Lama” so that includes all the South American camelids – rather than Lamas of the Tibetan variety. I’m going to be doing two workshops (or one long workshop in two parts, depending on how you want to look at it) on tablet weaving – the first covers how to warp and do basic patterns like stripes, checks, and solids, and the second covers three decorative techniques: double-face, Egyptian Diagonals, and Brocade. Who else is gonna be there? I know some of y’all go – definitely stop and say howdy if you do!